'The golden era may be happening right now' said The Guardian in May after witnessing a concert given by the Manchester-based Hallé Orchestra and their Music Director, Sir Mark Elder. One of the oldest orchestras in the world, the Hallé went through a difficult patch in the 1990s under Kent Nagano but is now ranked by some as the country's absolute finest. The change came with the arrival of Elder in September 2000, and with it a complete reinvigoration of the repertoire. In recent years I've witnessed the conductor lead the Hallé in some extraordinary performances: Elgar's Second Symphony, Mahler's Fifth, scenes from Rosenkavalier, the Verdi Requiem, and a memorable concert to celebrate the Verdi centenary in 2001, at which Rosalind Plowright – a key artist during Elder's ENO years – took over at the last minute as Eboli in the King's Study scene from Don Carlo. And the orchestra, which was my local band whilst growing up in Lancashire, has become noticeably younger over the past decade, as well as containing a much better male-female ratio. The sound has become warmer, and the ensemble's technical ability is truly excellent, stretched by Elder to become better informed when performing eighteenth-century repertoire, for instance. Two other innovations lead us nicely onto this new recording of The Dream of Gerontius. 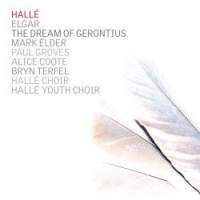 First, one of Elder's pet projects was the Hallé Youth Choir, which has now become more prominent in the orchestra's schedule, such as this rendition of Gerontius. And second, the ensemble started its own record label in 2003. After fifteen releases, though, they needed a new distributor, so it's only now, with Wyastone in place to take over, that new titles can be put out. Gerontius is an excellent choice to initiate the new series, because it's the large scale choral work that Elder has done – bringing together a large community of musicians – that has made the biggest impact since his arrival in Manchester. It's the orchestra and chorus that come off best here, with absolutely ravishing playing from the word go. The performance is both atmospheric and exciting – look to the Prelude for the former and the crescendo into 'I can no more' for the latter – and the choral work is always deft and sensitive. I have reservations about the solo vocal work, however. Bryn Terfel's contribution as the Angel of the Agony is technically impeccable, and his clear diction enables him to make sense of the words, but there's more than a hint of strain in his first entry as the Priest in the 'Proficiscere', with a fast vibrato and uncertain intonation not showing this great artist at his best. Paul Groves naturally has the lion's share of the work as Gerontius and carries it well, but he too sounds strained at times (the outburst at 'Oh Jesu, help!' for instance), and I wonder whether the singers were too closely miked. Alice Coote is the finest of the three, being better suited to the repertoire and sounding impressively full toned at the top of the register. Overall, the performance shows that the recently-knighted Sir Mark is completely in his element in Elgar, following on from his renditions of the composer's other oratorios, The Kingdom and The Apostles, in recent times. Elgar's reticence about religion, his love of the English choral tradition and his mixed feelings about the idea of life after death all come to a head in Gerontius, and Elder embraces the piece's ambiguities at the same time as showing complete conviction in technical aspects such as word-setting and orchestration. I wish the vocal performances were stronger, because they do not compete with classic accounts by the likes of Boult and Barbirolli or more recent budget-priced options such as Colin Davis' no less convincing reading on LSO Live or Simon Rattle's account, now available on a bargain reissue. One small point about presentation: the printing quality is inconsistent and the paper seems quite cheap, which lets the release down a little. Nevertheless, Elder's conducting and the performance of Britain's finest orchestra are well worth the price of purchase. Read a review of Mark Elder's disc of Wagner highlights here.